St. Andrew's Parish, Teesville, is an amalgamation of 4 former parishes in the Eston / South Bank areas; St. Andrew's in Teesville, St. Peter's in South Bank, St. Anne's in Eston and St. Mary's in Grangetown. 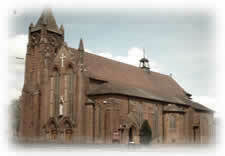 The original parish of St. Peter was formed in 1874 followed by St. Mary's in 1886. Together they served the Irish and Lithuanian immigrants who worked in the smelting works by the River Tees. Lapsed and New parishioners are very welcome! In 1962, as the terraced streets near the works were demolished and new housing was built further south towards Eston Hills, St. Andrew's parish was formed followed in 1970 by St. Anne's. In 1984 St. Gregory's was built as a chapel of ease to St. Andrew's. With the migration of workers during the 80's and a high level of vandalism it was decided to demolish St. Mary's in 1989. For a number of years Sunday Mass was said in St. Mary's School but this was later moved to St. Anne's at Eston. With the shortage of priestly vocations the 4 parishes eventually amalgamated and became one parish in 2002, under the banner of St. Andrew's and parish priest from St. Peter's, Fr. Neil McNicholas. in January 2005 Fr. Neil moved onto new pastures and Fr. Dominique Minskip, assisted by Fr. James Blenkinsopp and Deacon Pat Thomas, held the reigns and carefully steered our new parish through a short period. Unfortunately, with the number of available priests continuing to fall the decision was made to close St. Gregory's in August 2006. Shortly after in September, much to our dismay, Fr. Dominique left to take up a new appointment as Parish priest of English Martyrs in his home city of York. In his short period of time as Parish Priest Fr. Dominique settled and united the parish with his steady hand very approachable manner. However, time moves on and Fr. Dominique was replaced by Canon Edmund Gubbins, the former Episcopal Vicar of the Northern Vicariate. Canon Gubbins is very welcome into our parish community as our united parish looks to the future. Just after Canon Gubbins joined the parish he gave the green light for the first ever youth Mass to be held in our newly amalgamated parish on National Youth Sunday (November 26, 2006); this was a huge success and has led to plans for a youth Mass to be held every 2 months. Canon Gubbins also pushed forward with the plans for the new youth club, which was in the pipeline for some 18 months; it was opened for the first time on St. Andrew's Feast day (November 30, 2006) and now has 48 members. Over the years, Religious Sisters have played an important role in the pastoral work in the parish. The Sisters of Mercy ministered in what was St. Peter's parish from 1897, traveling daily from their convent in King's Road, North Ormesby. In 1900 three houses were rented in Nelson Street where they lived until 1919 when Crossbeck Convent in Normanby was bought. For many years they taught in two of our primary school's, St. James' and St. Peter's ensuring that Catholic children were given the very best grounding in education, our faith and morals. The sister's left the area in 2003. 1n 1920 the Daughter's of Charity came to Robert Street, Grangetown, in what was then St. Mary's Parish. They devoted their care and resources to the schools and people of the area. 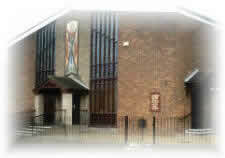 As Grangetown developed south-wards the Sisters extended their work to include pastoral ministry in St. Anne's parish. They left the parish in 1997. In November 2002 the Sisters of the Cross and Passion, a relatively unknown congregation in the north east of England, made their second foundation in the diocese. Sisters were already working in the parishes of St. Alphonsus and St. Pius, living in what had been St. Pius X presbytery. Two Sisters came to live in St. Anne's House, Eston, to be a presence in the area and to minister generally in St. Andrew's Parish. The Sister's currently living in the parish, Cecilia and Maria, minister by the presence in the area and are actively engaged in every aspect of the parish life. In 2007 one nun from the Sisters of Mercy moved back into the area to live a simple life of solitude and prayer. Former Parish Priest, Fr. 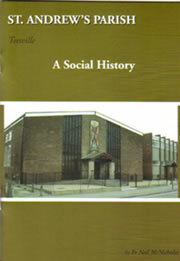 Neil McNicholas has written a book about St. Andrew's Parish entitled A Social History. This is the first book written about the parish and it starts with the story of Eston and the first Catholic churches in South Bank and Grangetown followed by the need for a new parish in the 1950's to serve Eston, Normanby and Teesville. The book then briefly covers the short history of St. Gregory's Church in Bankfields before going into detail of the amalgamation of the 3 parishes in the area. The book ends with a short history of the parish schools and a list of clergy who served at St. Peter's, St. Mary's and St. Annes. The book is on sale at the back of all our churches price £2.50.